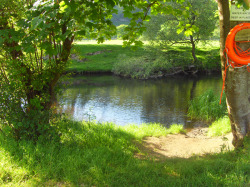 Llechrwd riverside campsite, situated within the Snowdonia National Park, is a small family run scenic site on the river Dwyryd in the beautiful Vale of Ffestiniog. On the upper field there are 8 pitches with electric hook-ups for caravans, with another 12 pitches with hook-ups for camper vans, trailer tents and tents, on the lower field there is a spacious area for tents alongside the river Dwryrd. The site is reasonably level. There are toilets & showers, a washing up room and a chemical toilet disposal point. a spacious washing up room with tourist information, including two sinks at different levels. Plus washing machine & tumble dryer. Pets are welcome (on leads on site please). There is a riverside & wild flower meadow walk on site. Nearby are woodland walks, including Rhaedr Cynfal (the Cynfal waterfall) and mountain walks in the Moelwyns. The sound of Ffestiniog Railway trains can be heard coming from the hillside high above the site. The R.S.P.B Glaslyn Osprey viewing site is a 15 min. drive away and the Llechwedd carverns site for choughs is also about 15 min. drive away in the other direction. Zip world titan and bounce below can also be found at the Llechwedd slate caverns, along with the Antur Sstiniog downhill bike trails. Other attractions within easy reach include the Ffestiniog & Welsh Highland Railways, Portmeirion Italianate Village & Gardens, Plas Tan y Bwlch Gardens, Plas Brondanw Gardens, the award winning Llechwedd Slate Caverns & Harlech Castle, theatre & golf course. In Porthmadog there is a Leisure Centre, Cinema, Harbour, Maritime Museum & golf course. You can also walk through to the bays & sandy beaches of Borth y Gest. Llechrwd is accessed directly off the A496 approx.1 mile from Maentwrog on the left hand side of the road travelling towards Blaenau Ffestiniog (approx 3 miles further on). Buses stop at the entrance by request. Electric hookup pitches are available on the upper field only (so it is NOT possible to be by the river and have electric), these pitches can take tents, caravans , motorhomes, & trailers up to 22ft, any vehicle longer than this will not get in our entrance or fit on the pitches. Please book in and pay on arrival, and only pay for the nights you are sure you want as we do not offer refunds. 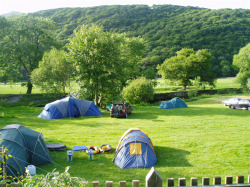 Deposit of 1 nights camping fee for up to 1 weeks booking required at time of booking. If booking for Bank holidays we only take a minimum booking of three nights which will need to be paid for in advance. Reservation will be confirmed on receipt of deposit if email address supplied. Booking may be cancelled if deposit not received within 21 days. All deposits are non refundable but we will do our best to transfer your booking to another date if enough notice is given. Warning: Riverside pitches can flood in extreme weather conditions, if you are concerned , please request a pitch on the upper field. We hope you enjoy your stay at Llechrwd, but please respect other people’s right to enjoy theirs and respect the campsite and the environment. 1. NO CAMPFIRES without a permit, please ask at the house. 2. NO LOUD NOISE OR MUSIC between 10pm and 9:30am, and NO LOUD MUSIC at any time – please respect your neighbors. 3. NO DISPOSABLE BBQ’S allowed onsite, reusable BBQ’s are allowed as long as they are kept high enough off the ground so the grass doesn't get scorched. 4. PLEASE KEEP DOGS ON LEADS, OR tethered AT ALL TIMES, even around the meadows, and please clean up any mess. 6. Please leave your pitch clean and rubbish free when you leave, and vacate the pitch by 12 midday. 7. Please take your rubbish to the rubbish and recycling area located near the main gate. Please keep food waste separate from all other rubbish and put in the small brown bins. Glass, paper, cardboard, drinks cartons, rigid plastic, metal tins and tin foil can all be recycled, please put these in the white boxes. Used coals or ash can go in the metal bins, and anything that cannot be recycled can go in the black bins. We really appreciate you recycling as much as possible, thank you.